Landscape and irrigation contractors understand that remote soil moisture sensors and smart irrigation systems have the potential to revolutionize the way people use water. 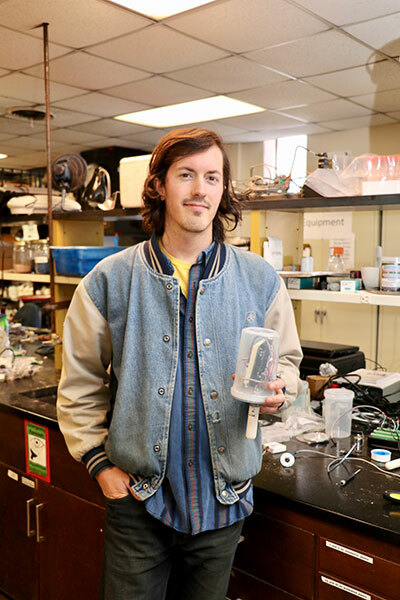 University of Georgia (UGA) College of Agricultural and Environmental Sciences (CAES) horticulture student Jesse Lafian has secured more than $60,000 in grant funding to develop a soil moisture sensor that’s accurate and affordable. He pitched his concept during GIE+EXPO in Louisville, Ky., during “Shark Tank, The Landscapes 2017 Edition!” to a panel of green industry experts including Judy Guido, chairwoman of Guido & Associates; Jim McCutcheon, CEO of HighGrove Partners; Mike Rorie, CEO of Go iLawn; and Doug York, CEO of Ewing Irrigation & Landscape Supply. Several “sharks” expressed interest in potentially investing in his technology. Today, most automated irrigation systems are controlled by timers, regardless of soil moisture. A conventional tensiometer, a type of soil moisture sensor, isn’t used to control irrigation systems because it requires continual supervision. Lafian’s tensiometer does not. His sensor enables irrigation control based on the availability of water to plants. Sprinklers only engage when plants have restricted access to water and run as long as it takes to restore adequate moisture. The technology is being tested as part of Lafian’s startup, Reservoir, a business he launched in early 2016. He moved to Athens, Ga., to work as a research assistant in the UGA College of Engineering in 2014 after receiving his associate’s degree from Tompkins Cortland Community College in Dryden, N.Y., and completing a National Science Foundation-funded oceanography internship. He began pursuing a bachelor’s degree in horticulture in fall 2015. Lafian has applied for a patent on his sensor and plans to sell it to landscapers, farmers, golf course superintendents, scientists and homeowners. Lafian thought of creating the tensiometer in fall 2015 while taking a “Soils and Hydrology” course. In spring 2016, he turned his idea into a business, and in the fall, he participated in the Idea Accelerator program run by Thinc at UGA and Four Athens, a local technology incubator. Lafian is using the grants he secured to develop and test his technology so that field trials can begin. Several institutions at UGA have supported his work, including the Office of Sustainability, the Center for Undergraduate Research Opportunities, the Terry College of Business and CAES through its newly launched FABricate entrepreneurship program. Lafian has hired two UGA engineering students to fine-tune the tensiometer’s electronics, website and app. He has collaborated with the UGA Instrument Shop to build several prototypes to be tested on UGA’s Athens campus. Melancon is a writer for Southscapes, a semiannual publication of the UGA College of Agricultural and Environmental Sciences, where a version of this article originally appeared. Additional reporting by Marisa Palmieri.